The Dryden Eagles court sport teams took advantage of their last home stand of the season, winning in all four matches vs. Beaver Brae today. The Senior Boys defeated the Broncs in four sets, starting off with a back and fourth 28-26 win and following with 25-12, 16-25 and 25-21. 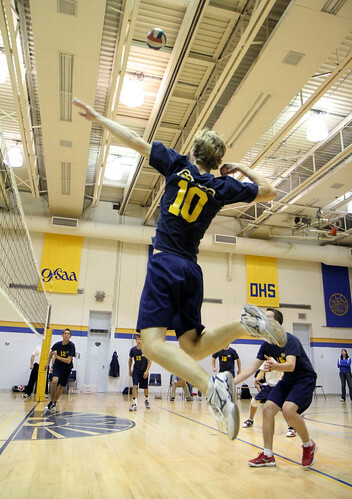 The Junior Boys sent Beaver Brae packing in three straight – 25-20, 25-14 and 25-9. In Basketball, the Senior Girls shut down Kenora offensively in a lopsided 39-13 tilt. Halle Lobreau led the team with 9 points. Morgan Church and Carly Kaus followed with 8 and 6 respectively. The Junior Girls were held close for the first half but outgunned Beaver Brea later in the game for a final score of 37-23. Ashley Kropelin was the high scorer with 10 and Alana Benson added 6. Congrats on a great season so far, Eagles! October 28th will see the Eagles travel to Beaver Brae for the rematch to close out regular season play. NorWOSSA finals are on November 10th in Fort Frances this year.